According to TASS, a major Russian news outlet operated by the government, international student enrollment at Russian universities increased by 40% from 2013-2017, reaching a height of 290k students enrolled. And according to iie, Russian enrollment numbers continued to tick upward in 2017-2018. According to iie data (which includes all foreign students enrolled in Russian universities: undergrads, grads, and short-term students), Russia hosted 296k student in 2017, and 313k in 2018. Most of Russia’s top-sending nations are former Soviet bloc members with close cultural ties to Russia, so it makes sense that students from these countries would be most attracted to Russian universities. For the vast majority of these students, language is not an issue. However, this list is also the result of active recruitment efforts by the Russian government. Russia offers generous government funding to students from countries with which they have strong relationships—in 2016, this meant, for example, that there were 855 full scholarships offered to Vietnamese students, 830 to Chinese students, 342 to Tajikistani students, and 150 to Uzbekistani students. Even for students who don’t obtain a scholarship, tuition is cheap—we’re talking as little as $2k per year for undergraduate tuition. Housing costs are affordable as well. And here is the compelling aspect for students from a range of African nations considering education abroad. Russia's strength in computing, math and the sciences (STEM programs) is clear. That many of these programs do not require as much strength in language skills as other disciplines helps as well. The tuition and housing price point, the academic strength in career-focused disciplines, the push to offer more coursework in English -- all of these add up to a compelling package for some. How will much higher priced offerings in the US, UK, Canada, Australia and Germany stack up? How will Russia's plans impact international student mobility trends -- especially the growing number of international students from African countries where price point and career focus are hot. In June 2017, the Russian government announced an ambitious plan to boost international enrollment higher still. By increasing international student supports at leading Russian universities, expanding English-language offerings, increasing the availability of a variety of international-friendly programs (including pathway options), investing in academic marketing, and easing visa regulations, the government hopes to enroll over 700,000 international students by 2025. To achieve this, Russia will need to expand its recruitment efforts outside of the former Soviet Union—meaning that the competition with western universities is only going to grow fiercer. Russia’s amped-up efforts to enroll international students stems from a complex mix of motivations. In February 2018, The Forum for International Education gathered education leaders from around the world in Moscow to discuss how Russia could meet its 700,000 student target. They asked Ben to be there to share Intead's perspective on global digital marketing. As all international enrollment professionals know, universities are typically genuinely committed to the promise of intercultural exchange. See Ben's popular blog post with reflections on the Moscow conference HERE. And governments, of course, have strategic and economic drivers that influence their actions. Like many governments, Russia sees the prestige of its universities as a marker of its world power. The government aims to have at least five Russian universities ranked among the top 100 in the world by 2020 -- and increasing the internationalization of their universities is one way to achieve this. See Russia’s rise in THE’s Emerging Economies Universities Rankings for evidence of the impact. While we are skeptical of them achieving these goals in the time frame they have set, we absolutely applaud stretch goals wherever we see them. Achieving stretch goals requires significant investment in marketing or significant patience if you don't put in those funds. Education is also a way to develop political “soft power.” International enrollment can foster relationships with young leaders from abroad, who may continue to work in Russia post-graduation, or bring friendly feelings back home with them. And of course, providing scholarships to students from allied nations is a way to reward friendship (just as other educational policies can be used to retaliate against political foes—see Russia’s 2018 effort to call home its students enrolled in UK universities). 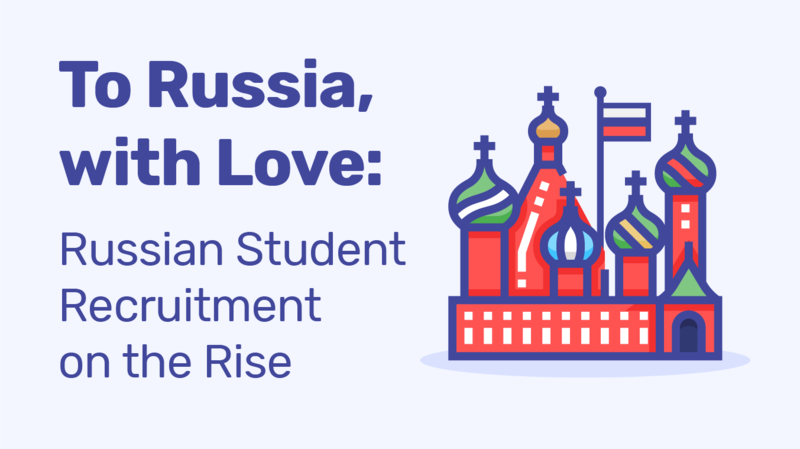 Even without delving too far into the fascinating geopolitics of international student recruitment (we know -- you probably haven’t even finished your coffee), Russia’s rise is important for enrollment professionals to keep an eye on. With many universities feeling nervous about Chinese enrollment in particular (did you see that the University of Illinois at Urbana-Champaign has taken out an insurance policy to protect against the financial risk of a future decline? ), Russia’s success should serve as another reminder that this is no time to sit back and relax. Now more than ever, enrollment professionals need to be considering what value their institution can offer to international students—and whether their leadership is equipping their recruitment teams with the resources needed to effectively communicate that value. International student enrollment is increasingly competitive, but institutions who take the challenge seriously are continuing to grow and flourish. Contact us and let's get going.